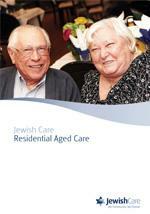 For many years, Jewish Care has maintained the highest reputation in aged care service. All of our residences consistently receive perfect accreditation scores and, thanks to our professional and committed staff, are places of security, warmth, and love. We are dedicated to providing the very best of inclusive, culturally-sensitive, and high-quality care to all who need it. We offer a range of accommodation packages and levels of care tailored to the needs of Elders living in our residences. *Note: Not all accommodation levels are available at all residences and are dependent on availability. Traditional packages offer the best of residential care where all your needs are met. Traditional service is for Elders with limited capacity to pay an accomodation payment and/or are solely reliant on the aged care pension. This service package is offered at Gary Smorgon House, Montefiore Homes Community Residence, and Smorgon Family Nursing Home. The best of residential care where all of your needs are met and the little extras taken care of. Classic service is for Elders with the capacity to pay an accomodation payment and additional income to pay for extra services. This service package is offered at Gary Smorgon House. combination accommodation payments, including a partial lump sum and daily payments. The room price is $500,000. Find detailed accommodation costs for each residence, click the links below. Support with daily activities such as bathing, eating, dressing, moving around, and accessing health services. Includes: accommodation, meals, laundry, and 24-hour on-call staff support. Catering to the care needs of those with a higher degree of frailty and in need of clinical nursing care. Includes the same services as low care support. Ability to purchase higher levels of personal comfort and more individual lifestyle preferences, such as larger rooms, wider menu choices and wine with meals. Targeted services with specialised staff and facilities to support people with memory challenges from early to advanced stages. Support for people with a life-limiting illness to ensure comfort and quality of life with a focus on pain and health management. Addresses the physical, emotional, cultural, social and spiritual needs of the person, their family and carers. We offer temporary accommodation and care for people whose carers are unavailable to meet usual care arrangements and need a break from caring. People living alone may also choose respite care. More information can be found on our aged care respite page. We offer a range of services to support people in living independently in their own home for longer. Our in-home care services and Active Living Centre programs help people maintain their health and wellbeing and remain active in the community. We invite you to find out more about our residential aged care packages, accommodation costs, and levels of care. For more information, please download the brochure below and contact our Front Door on (03) 8517 5999 or submit an online enquiry.